You've probably read the claims by the Defense Department that 61 of the released Guantanamo detainees have returned to terrorism. Not so, says a new report from the Seton Hall Law School's Center for Policy and Research (and Law Prof Mark Denbeaux and attorney Joshua Denbeaux). 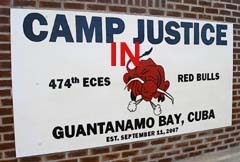 The Denbaux' have previously authored compelling reports on the detainees and represented a few of them.